The number of people registered to vote in elections in Scotland has fallen for the first time since 2009. 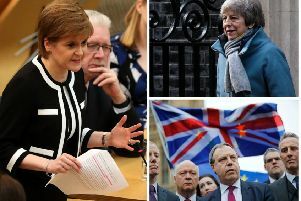 The registered electorates for local councils, the Scottish Parliament, the UK Parliament and the European Parliament have all seen reductions, according to figures published by National Records of Scotland. On December 1 2015, 4.03 million people were registered to vote in local government and Scottish Parliament elections - a decrease of about 100,000 compared to March 2 2015. Meanwhile, 3.9 million people were registered to vote in UK Parliament elections - a decrease of around 139,000. The number of European Union (EU) citizens registered to vote in local government and Scottish Parliament elections increased by about 7,000 to nearly 96,000. This is likely to underestimate the total number of EU citizens resident in Scotland since some may not register to vote. It is thought the move to individual electoral registration (IER), rather than one person in each household completing the registration for every resident eligible to vote, is the main cause for the drop. READ MORE: How much does it cost to maintain a happy marriage in Scotland? Andy O’Neill, head of the Electoral Commission in Scotland, said: “The registers published on December 1 2015 are a snapshot of the electorate at that time and they indicate there has been a reduction in the number of entries since the last registers were published under the household system. “However, a lot more has and will continue to be done to ensure as many people as possible know that they need to register to vote before the deadline, and how they go about doing so. The deadline for registration to vote in the next Scottish parliamentary election is April 18.